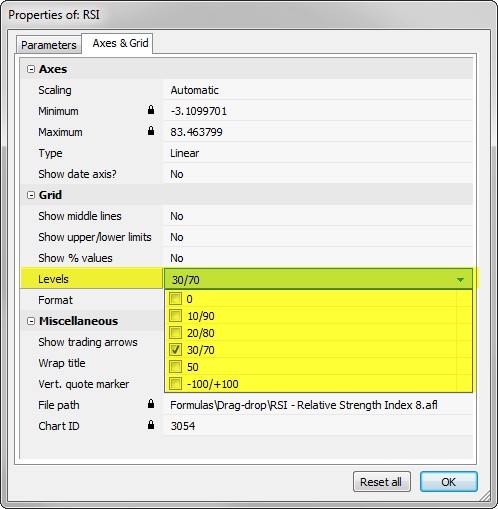 Built-in RSI indicator offers the ability to display one of predefined grid levels to indicate oversold and overbought regions. This can be done in Axes&Grid tab of Parameters window available under right-mouse button. Now, since the formula uses Param function as input, the custom grid levels can be defined and modified in Parameters tab. When we want to paint the background with custom colors to indicate certain states or conditions – we can use area plots style for this purpose. The code example presented below shows green background when Close stays above 50-period moving average and red when below MA-50. There is an easy fix for that – AmiBroker allows to specify the Z-axis position too, so we can shift the visibility and order of plots (including their position against grids and other elements) by means of Z-order argument of Plot function. If we specify the Z-order argument to -1 that means we move the particular plot one level behind and this would also be located below the grids. 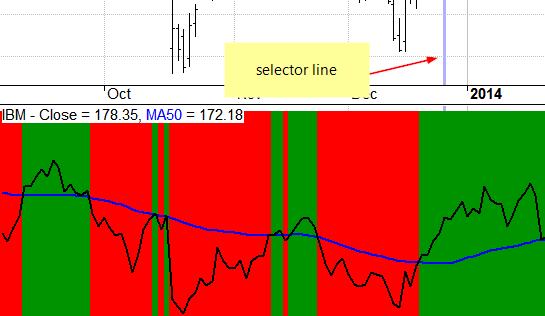 When we want to calculate high / low of selected hours of the trading session (e.g. 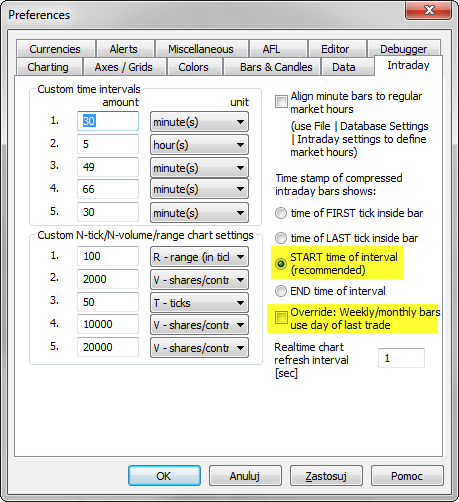 first two trading hours), we can refer to TimeNum() function to identify timestamps of the bars. 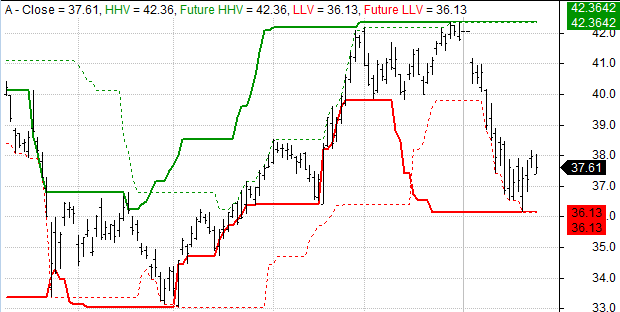 Then with use of HighestSince and ValueWhen functions we can obtain the high/low readings we need. Now we can use myH and myL arrays in strategies that e.g. 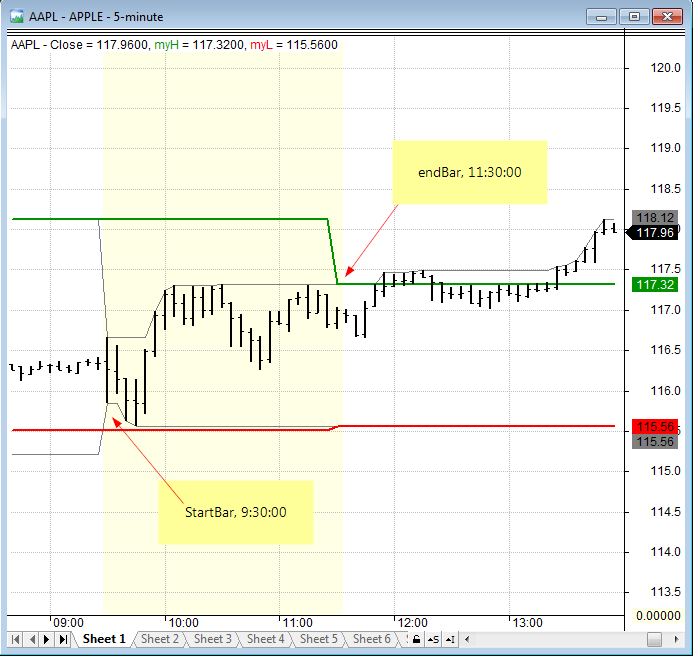 check for breakouts from the first two hours of trading session etc. By default, the Plot function draws the graph for all visible bars. 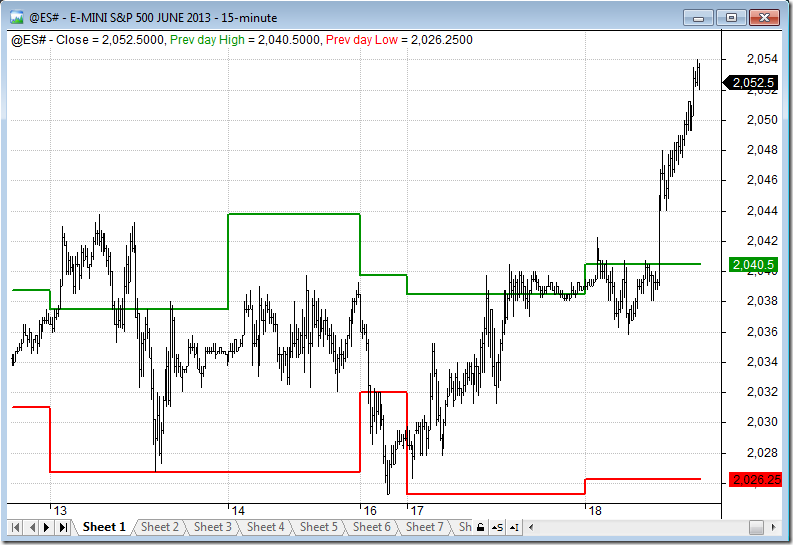 In some situations however, we may want to draw some selected bars, leaving remaining chart space unaffected. To achieve that – we simply assign Null value for the bars that we want to skip. Our graph will just be drawn for the non-null bars. This simple example draws candlesticks only on Mondays and leaves empty all the other days. The following example shows how to restrict the visibility to last N bars. The code defines a custom function, which can be called later on for the arrays we want to show only partially. 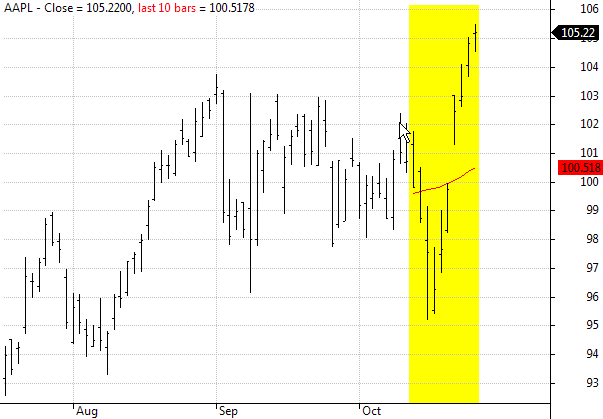 In the above chart both Moving average (red line) and yellow shading area have been restricted to last 10-bars only. The full name of the security can be retrieved in AFL using FullName() function. To apply these changes choose Tools->Apply Indicator from the menu. If we have Full name information imported into the database and visible in Symbol->Information window, the updated chart title will show it next to the ticker name. Normally it does not present any problem as long as we use array functions, because array functions check for Nulls occuring at the beginning of the data series and skip them appropriately. The story is different when we try to use loops. If we want to use looping code in higher time-frame, we can not really start our calculations from the bar 0, because it would contain Null instead of real data. That is why we would first need to detect were the actual compressed data begins and start calculations on that particular bar instead. In situations, where we do not need to calculate any indicators based on higher interval data, but rather just read OHLC, V or OI arrays – TimeFrameGetPrice is the most convenient function to use. To plot daily High and Low levels we just need to read the respective arrays calling: TimeFrameGetPrice(“H”, inDaily ) – the first argument specifies the array we want to read, the second argument defines the interval we are reading data from. As with any other TimeFrame functions – we can only read data from higher intervals, so it is possible to read daily data when we work with 1-minute quotes, but not the other way round. TimeFrameGetPrice() functions allow also to easily shift the reading by N-bars of the higher interval if we specify that in 3rd argument of the function, so calling TimeFrameGetPrice( “H”, inDaily, -1 ) will return the high of previous day.